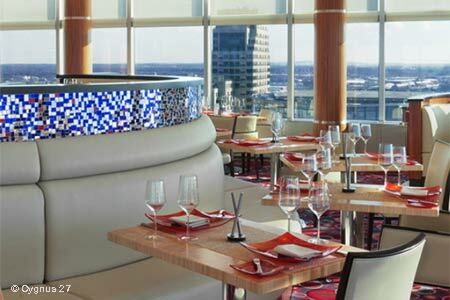 Latin American-inspired fare and city views at this Amway Grand Plaza restaurant. : Cygnus 27 offers city views from its elevated perch at the Amway Grand Plaza hotel. The Latin American-inspired fare from chef de cuisine Tim Moreno ranges from halibut ceviche to corn-crusted calamari and spiced pork chops with scallion arepa. End the meal with arroz con leche crêpes or the coconut crème brûlée.